By most measures, the economy is doing great. The US labor market is creating around 200,000 jobs a month, which has brought the unemployment rate tumbling to 5%. 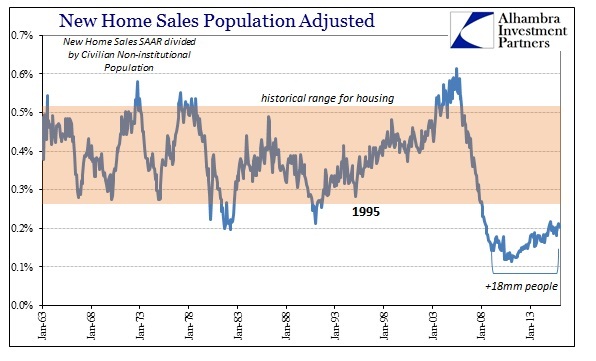 Meanwhile, home prices are up and stock prices (GSPC) are near all-time highs. If that is all there is to indicate the mainstream version of the economy, we really are in serious trouble. The major payroll statistics are increasingly detached from even orthodox measures of broader data on the labor market. There is also the massive inconsistency of global trade collapse and the US manufacturing recession that are mutually exclusive to the idea of 200,000 jobs a month. Home prices are up, but the overall real estate condition is conspicuously odd and actually suggests major economic problems. Stock prices might be near record highs now, but they have been that way for almost two years with increasing volatility; sideways suggests only swelling, broad-based caution about fundamental prospects, not evidence of Janet Yellen’s vision. With so very little holding up the idea of continued and even more robust advance, you might wonder why economists don’t challenge their own views. It is pure ideology as at the center of monetarism is the core, unshakable faith in monetarism – “stimulus” always works, and the more of it that is delivered the better the economic prospects. Rather than reconsider whether any of that is actually true, economists have been busy trying to explain why you don’t see it. At least they now understand that there is indeed a very wide gulf between their version and what the vast majority of everyone else perceives. So, why are there so many people so reluctant to acknowledge how good things are today? This sentiment delivered in this article was written by Sam Ro, the managing director at Yahoo!Finance. Basically, he believes that people are still so affected by the events of 2008 that they can no longer see straight; and are therefore not capable of making rational economic judgments and should instead totally defer to the “experts” about what is really happening. In the field of behavioral finance, one behavioral bias that is studied extensively is regret aversion. Regret aversion occurs when the unpleasant memory of bad decisions in the past puts undue and irrational influence on future decisions. For example, you lose 20% in the stock market in a very short period of time, so you decide never to buy stocks again because of your perpetual expectation that the market will soon crash again. Monetarists and their mainstream parrots really do think you are that stupid. He is right about his pronouncement, though, as the one qualification of this recovery is certainly “trauma”, only it is the economy’s not the people stuck in it. 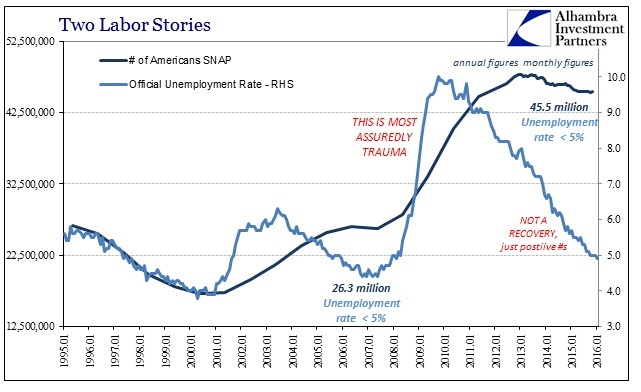 We can find economic trauma in almost every single economic account, though it appears perhaps most effectively (unfortunately for economists) in the very “evidence” they use to justify the economy as it “should be.” In the labor market, the economy has undergone structural trauma in what can only be a shrunken baseline or trend. 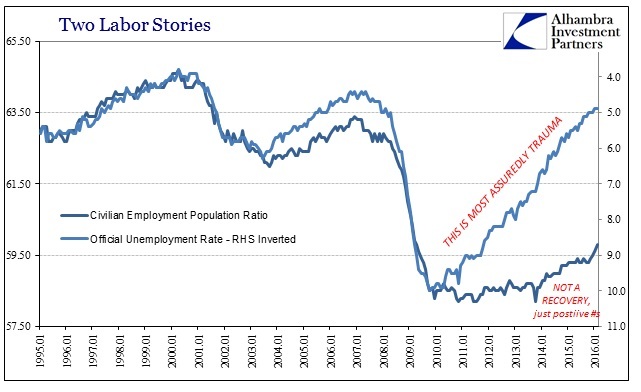 The unemployment rate falls not because the recovery is so much better than we might realize, but rather because it is as bad as it seems to the layperson – so many millions remain missing in the denominator while that shrunken level of activity has seemingly “forced” the BLS to greatly exaggerate any positive variation in the numerator. Economists just accept the number “as is” even where it doesn’t agree with anything else (where a truly scientific endeavor would set out to find a rational and sensical explanation to the disparity, even if it means pulling the Establishment Survey apart to actually figure out what the BLS is doing). Because it is the result they want to see, it is given exalted status as if it positively disqualifies the lengthy (and growing) catalog of evidence set against it. In terms of housing, prices are definitely much higher but it is far from clear that they have to do with anything in the actual economy. In fact, there is far more evidence to suggest that they are as high as they have gotten based on the same economic trauma as we find in the labor market. The recovery in housing is as deceptive as the one we are supposed to believe in the economy. And again, as far as stock prices, the dominant premise even with the S&P 500 around 2,100 and the DJIA near or above 18,000 is doubt. 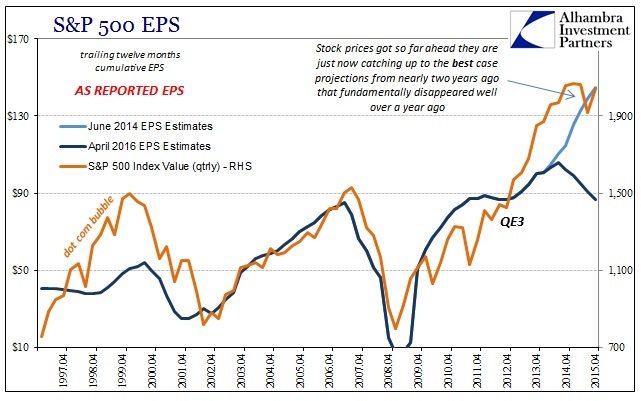 This comes not from irrational views on the economy as it increasingly appears even to those that dismissed doubt for years, but as a result of all those past “stimulus” promises that buoyed stock rationalizations for so long failing to show up when stock “investors” needed them most. 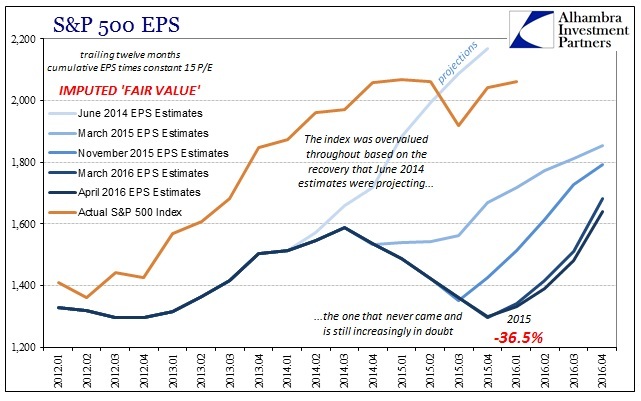 What was supposed to be an earnings “floor” delivered by “stimulus” actually working was instead revealed last year and early this year as intense vulnerability. Rather than suggest that the economy is far better than most seem to appreciate, it offers quite compelling evidence that it is economists who are, like the actual recovery, traumatized – and why wouldn’t they be? Decades of hard belief about orthodox theory and policies have come to nothing, maybe even worse than nothing as it has just unraveled these past almost two years. Stocks, housing prices nor the employment statistics have been much help, with the economy increasingly sinking despite repeated incantations that Janet Yellen’s unemployment rate faith and the stock bubble will save everyone. Actual spending has disappeared (personal and business capex), global trade is collapsing, and “global turmoil” has become the dominant if itself misguided theme. It is a lengthy slowdown that just won’t stop. The issue isn’t about debating how good it might be right now, it is coming to terms with the fact that it was never anything but bad all along. Economists and the media have so thoroughly deluded and convinced themselves that if it’s not like a full-blown recession right now then it must be some version of “strong”, as if those are the only choices. Again, trauma is the perfect description of this “cycle”; it is economists, like the economy, that have yet to recover from it.